Israel's Ambassador to the United Nations Danny Danon calls on UN to condemn Abbas' blaming of Jewish victims of the Holocaust. Israel's Ambassador to the United Nations Danny Danon sent a letter to the UN Security Council demanding condemnation of the latest anti-Semitic remarks by Palestinian Authority Chairman Mahmoud Abbas. “Such a hateful diatribe against a people who have undergone thousands of years of intolerable persecution, is completely unacceptable. I call on all leaders of good faith to condemn these repeated hateful remarks and demand a full and sincere apology from Mr. Abbas. 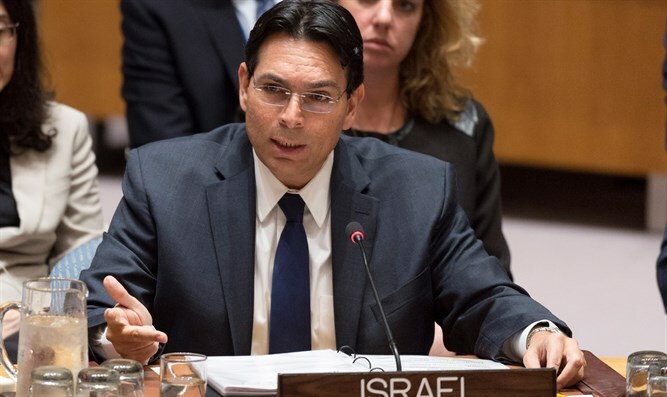 The Security Council must not stand idly by in the face of this incitement and apparent denial of Israel’s right to exist,” Ambassador Danon wrote. In a long speech in Ramallah at a rare session of the Palestinian National Council Monday, Abbas claimed that the Holocaust was not the result of anti-Semitism but rather of the Jews “social behavior, [charging] interest, and financial matters."